Starting off IZE Creative in 2011 was purely a leap of faith. I knew not what I was doing but I was as carefree as any person could be. Having lived 21 years of my life with my decisions being taken by my parents, it was enriching to finally take a big step on my own. I didn’t care about failure or success. I just wanted to try. For the first time I didn’t ask for opinions or advices or suggestions. I took a decision. And the decision stands till date, without even a moment of regret in between. What started off as a Social Media Marketing firm without a proper niche has now transformed to a full-on Content Marketing Firm. It’s not that we decided the path. After lot many wrong turns and dead-ends, we eventually understood this was our calling. The past 5 years have been as awesome as they have been terrible. I have cried as much as I have laughed. I have broken down into depression as much as I have jumped around with joy. I have hated as much as I have loved. A startup teaches you a lot of things. Firstly and most importantly, it teaches you to be humble. You might be the CEO on paper, but you’ll be kicked around by your competitors, clients and vendors until you’re bleeding in the mud. You’ll find yourself at the bottom of the food chain with everyone ready to pounce at you. Add the pity and disgust of certain people around you who do not understand the entrepreneurship mindset, and you have the perfect recipe of a soldier in a war-zone with no supplies and ammunition. Totally screwed to put it in 2 words. Somewhat similar has been, and still is, the scenario for me with IZE Creative. There have been many highs and lows in the past 5 years. From being thrown out of home to staying in a 5 star hotel on invitation. From being cheated by your friend to being helped by a stranger. All has happened. It was on the 9th of September 2011 when I decided upon the name of the firm, along with the help of a friend of mine. Hence the decision to fix the date as the Birth of IZE Creative. Amazing actually, considering that on the 9th of September 2011, I never thought I’d be writing such a post 5 years later. This year, as before, we decided to evaluate how the company has grown in the past one year i.e. 9/9/2015 – 9/9/2016. The values in bracket show the same figures for 2013-2014 YoY (Year-on-Year). Remote office started for both Kochi & Bangalore Teams. Increased Salary of all Employees by 25% due to this cost cutting. Rs 0/- Marketing Spend – as all our businesses are referrals or repeated business. With 5 years of solid backing, I am content. Yes, things aren’t perfect and neither am I. I have made mistakes and I still do. As IZE steps into its 6th year, new decisions are to be taken. New horizons to be explored. More on that later. 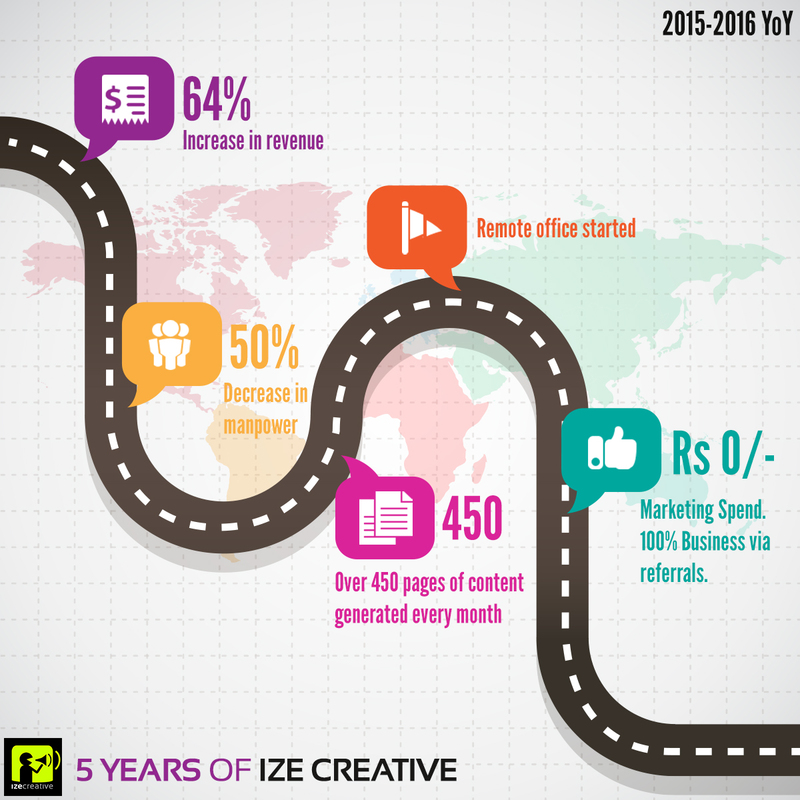 So, is IZE Creative a successful company? Yes and No. Yes, because we survived 5 years, not just with mediocrity but with growth, especially in the last 2 years. No, because we could have done better. Much better. I am arrogant enough to say I made the company reach this instant of glory. And am humble enough to say that it were due to my shortcomings it could reach only to these heights.